I’ve always been a fan of monochromatic looks. I love that aspect of pairing different shades of the same color together, especially with grey. It’s quickly become one of my favorite neutrals to wear. I’ve said many times how much I love creating new looks with older pieces. I’ve realized how much I constantly wear some of the same things over and over, like these jeans. I don’t think there’s anything wrong with that. There are countless outfit combinations in our closets just waiting to be worn. It’s always good to get your moneys worth too, am I right? I first bought this coat before my trip to Ireland and it’s quickly become one of my favorites. Regardless of my height, I actually prefer longer length coats over shorter ones. I just think that they’re so stylish and chic. 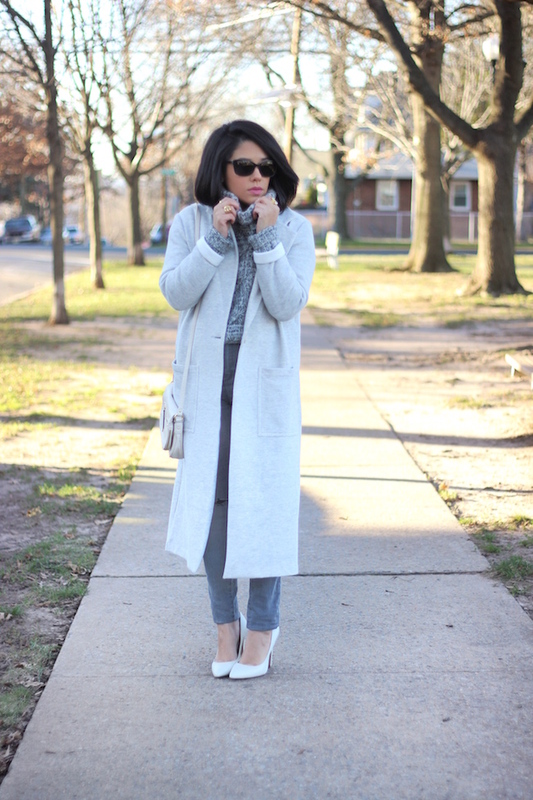 This coat might not be the warmest, but it works really well with layers. 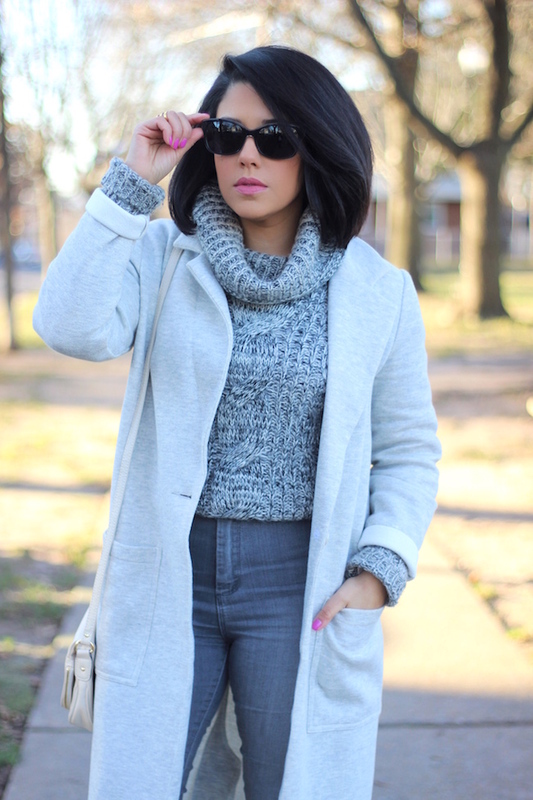 This chunky turtleneck knit was the perfect piece to pair underneath it. I’ve also got a long sleeve shirt under the sweater too for extra warmth. I think this sweater was a great way to bring the whole look together since I’ve got dark grey on the bottom and light grey on my coat. I seriously can’t stay away from knee ripped denim. It’s basically all I wear now. I just need to get a pair in white and I’m all set with the perfect collection. Your coat looks so cozy! Great look!! 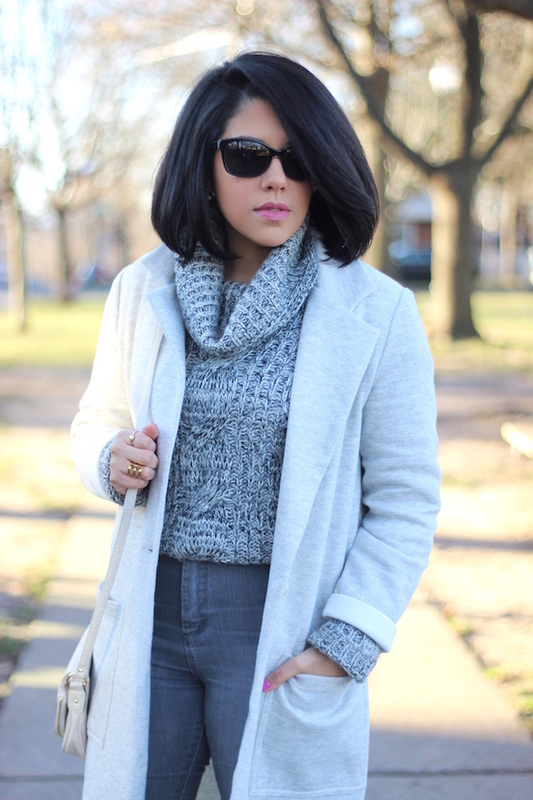 You're so chic in shades of gray! Love your look.